It is a silent night for the New York Rangers, taking a 2-0 loss to the Ottawa Senators in the second game of the regulation season (1-1-0). Martin Gerber, replacement goaltender to Ray Emery of the Senators, out shined our own Henrik Lundqvist and we are left scratching our heads. After giving up 2 goals in the first period, one thanks to our 'booing wonder' on-off-off defenseman Marek Malik, the defense and Henrik Lundqvist played a marvelous game holding off any additional goals. 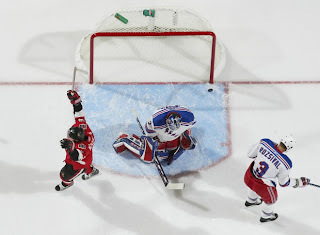 Though, with 35 saves credited to Ottawa this evening, the Senators played better and shutout the Blueshirts. Too disappointed to continue writing, you can read more here, here and here. 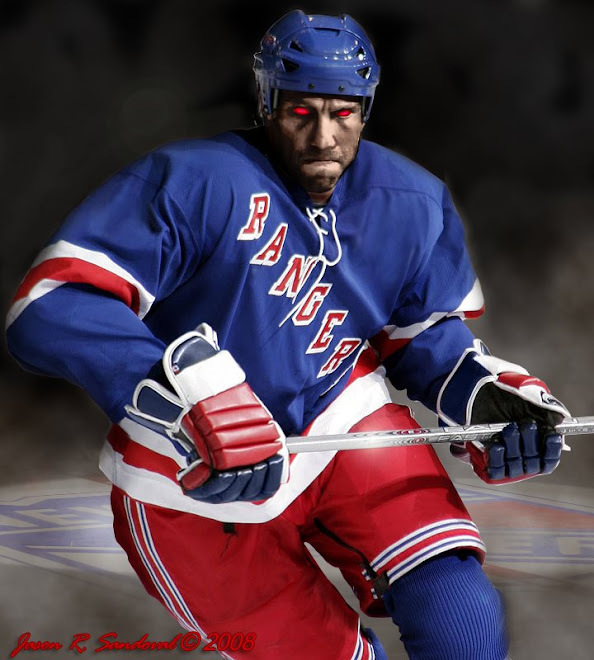 I said Gerber outshined Lundqvist. Scotty...Gerber played a shutout. I agree...Henrik played a helluva game, except for the 2 goals he let in. Love live The King. We'll get 'em next time around. those were sloppy goals - rosival and malik, and strudwick and drury bumping into each other defense cannot happen throughout the season, or we're going to have to really look at rebuilding the blueline. pisses me off. Hopefully next time I start watching them they will look a little better. jibble,...Tom Renney is still playing with the lines and attempting to find the right mix between the new acquired Drury and Gomez, and who matches with Jags (now that Nylander is gone to Caps Country) and the newly brought up prospects. It will be sticky for a while -- but in their first game against Florida, there was a glimpse only in the 3rd period when everything clicked, worked and you saw magic on the ice. Though, the first 2 periods were hard to watch. The Ottawa game was not great -- it should look miles better come this Friday on the rematch against Ottawa. We also need Jags to wake up early in the season this year -- now that he is healthy and ready to go. YOur buddy Avery is out for 4 weeks so that should be an adjustment as well. Your buddy Avery is out for 4 weeks so that should be an adjustment as well. fDuWfQ Your blog is great. Articles is interesting!